To use an AccuSharp tool, the knife blade is held with the sharp edge up, and the sharpener is pulled over it. The blue shield protects the fingers. A good way to start the new year in the kitchen is to sharpen those knives. If tending to your blades isn't routine, you'll be surprised how much more efficiently you can work when you're knives are primed. December's Cook's Illustrated magazine included a how-to, as well as ratings for sharpeners. That rod-shaped sharpener that came with your knife set? It's OK for quick tune-ups, but all it will do is straighten the edge. To truly sharpen, you've got to shave off tiny bits of metal to restore the sharp edge. The best job is done by an electric sharpener -- Cook's Illustrated picks the Chef's Choice Model 130 as the best, but it costs $139. If you'd rather not spend so much, the top recommendation for a manual sharpener is the AccuSharp Knife and Tool Sharpener, sold at Ace Hardware stores for about $12, which can sharpen a knife in about 20 strokes. 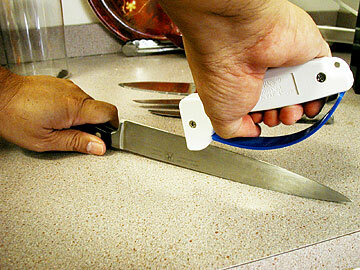 Now, if your knife is badly worn, to the point that the blade is notched, manual sharpening won't work. You'll have to invest in an electric sharpener, professional sharpening -- or a new knife.